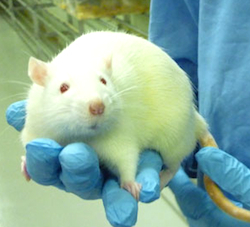 What happens when rats are fed a lifetime diet of Monsanto’s GMO corn, or exposed to Monsanto’s top-selling weedkiller, Roundup? It’s not pretty. Tumors. Kidney damage. Liver damage. In a study released yesterday – the first-ever long-term study of its kind – French scientists reported that rats fed a diet containing the herbicide-tolerant GM maize, or given water containing Roundup in amounts considered safe in drinking water and GM crops in the US, died sooner than the rats fed just the standard diet. The study was done by a reputable scientist, in this case a French physician, Gilles-Eric Seralini. Will this be enough to make the FDA start conducting independent testing of GMO’s – before allowing these products into our food supply? Or will the FDA continue to pander to Monsanto and tell us that GMO products are ‘not substantially different’ than non-GMO products? The demand to know what is in your food, will not stop. The more people are aware of GMO’s the more questions company’s like Monsanto, Kellogg, General Mills, Coca-Cola, PepsiCo and all the other corporations involved in creating GMO’s will have to answer. GMO’s should be banned in the United States they are being banned in other countries. The professors and their team came under heavy attack by the scientific world which included Monsanto scientist Richard E. Goodman. The teams research was discredited and ignored by the main stream press. The Seralini groups studies have now been republished and they have successfully defending their work also they have won this law suit. Please read the article for the complete story.